Bourbon History 101: What I know before World Class. So before I start researching into bourbons in preparation for the World Class exam I figured a quick catch up on what I already know on bourbon history was in order. It turns out I know very little about about its history, distillation or legislation. Bourbon is a distilled and aged alcoholic spirit originating from America’s southern states. It’s thought that a mix of Irish, Scottish and English first settled there in the late 1700’s and started working the land as farm land. These guys brought their knowledge of whisky and gin production with them and started producing alcohol from what was ready available, corn. They made a rough clear alcohol which was then shipped in barrels to New Orleans and sold much more cheaply then the imported French Brandies. Farmers producing the spirit would wait until the spring when the rains would swell the rivers, making the journey easier and so cheaper to transport the whisky. This time waiting in the barrels aged the product, making it softer, smoother and easier to drink as well as it now also resembled the brandies in colour. The spirit was primarily sold out of Bourbon Street in New Orleans and so people would ask for “that whiskey they sell on Bourbon Street” which eventually shortened to “the Bourbon Whiskey” which is where the name Bourbon is thought to have come from. Charring the barrel supposedly comes in around 1820 after Elijah Craig, a man with a lot of firsts on his plate, has a fire in his barn where he stores the new barrels. After already losing so many barrels he has to be frugal and so uses ones which are charred but mostly undamaged. The resulting spirit is sweeter from the caramelised sugars in the charred wood. It’s also around this time when Catherine Carpenter starts putting the yeast solids of the first fermentation into the next batch, naming this the sour mash recipe. She also publishes a sweet mash recipe which falls out of fashion fairly quickly. Production carries on and grows healthily until the prohibition in the 1920’s. All but 6 major distilleries shut, and the remaining few started distilling medicinal whiskey which was used to treat everything from teething babies, cancer, diabetes and old age. It was only available by the pint every 10 days, to be consumed at home and prescribed by a doctor, but it was generally distilled to around 50% ABV. When the ban was lifted in 1933, 77 distilleries opened and started producing either Bourbon or Rye whiskey. In 1964 the U.S. Government introduced laws which made bourbon a protected term, anything wanting to be called a bourbon now legally had to be made within the United States, from at least 51% corn, aged for a minimum of 4 years (unless stated) in brand new charred American oak barrels. There’s a few gaps to fill and a few exact dates to find before I start looking into distillation but at least this is a start. Although my knowledge is not as terrible as I expected so watch this space because as I learn more (ok google search stuff) I’ll fill in the gaps. Now when first experimenting in this area it seems quite simple, a few vanilla pods in some sugar syrup and Tada! Vanilla Gomme. Chuck a few Earl grey tea bags in gin, and voila tea infused gin. Yet the more we experiment the more we learn about balancing the ingredients to get the exact flavour we want and how to use them to enhance flavours of cocktails. Any good bartender knows there are many bitters you can buy and a few notable companies are Angostura, Fee Brothers and Bittermens. All respectably have an extensive range and work wonderfully when enhancing flavours already present in spirits. Angostura is the infamous one, seen in shops and supermarkets worldwide. The label is too big for the little brown bottle with a yellow lid. Add it to sugar and whiskey and stir with ice for an Old Fashioned. Chuck it in with rum, lime and ginger beer for a Dark and Stormy. A couple of drops even livens up a lime and soda, it really is that versatile. At this time of year Fee Brothers Black Walnut Bitters goes in just about everything for me, as it adds a winter warming spice. Anything with chocolate flavours and Bittermens Xcolotl bitters adds that bitter-sweetness that usually only really dark chocolate can impart. When there’s easily available, ready-made, perfectly brilliant products there for the taking (sorry, purchasing), then why would we bother creating our own? The answer is simple; it’s a massively useful tool to have at your disposal when creating cocktails, even if it takes a few goes to get exactly what you’re looking for. The difference between the two is pretty simple. An infusion is one or several flavours added to the base spirit of a cocktail in low concentrations. So basically a little flavour added and a lot of alcohol used. A bitters is a blend of flavours added to an alcohol with a high ABV in a high concentration. So a lot of flavour added and a little alcohol used. Bitters generally are a blend of different ingredients, if it’s just a simple single flavour then we would use the term tincture. A few tips and tricks. Sample a small batch first as this will give you the chance to try it within a couple of hours and without ruining a large amount of alcohol if it doesn’t go according to plan. Taste it little and often, different flavours extract into the alcohol at varying rates. Things like tea’s and citrus will impart flavour quickly but will slowly release tannins and bitter components and can easily over infuse, whereas fresh spices and herbs will take longer. When making bitters, experiment with different amounts of flavours, you will find that you prefer one more then others. Maybe one with extra citrus peel, maybe one with more cloves, one with more tea or whatever it is your experimenting with. 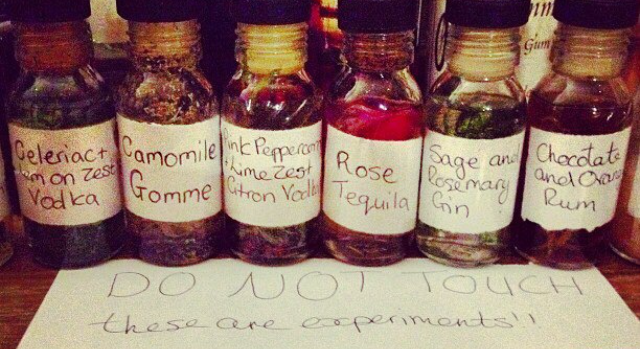 Always write your recipes down and label your different experiments. You will kick yourself if you find the version you like best but can’t remember how you made it. When infusing alcohol be aware that the higher the ABV the quicker it will happen and the more bitter flavours are extracted easier. There’s a lot of infusions that we’ve tried over the last couple of years, hibiscus and pink peppercorn vodka, dill gin, honeycomb bourbon to name a few but it’s the bitters which are much more interesting. There’s a couple that we’ve spent a long time perfecting and have now been using ever since. Bloody Bitters perfect for Bloody Mary’s. Half a fresh horseradish sliced into very thin strips. A whole yellow pepper, sliced. 4 tablespoons of mustard seeds. 2 teaspoons of smoked paprika. 2 teaspoons of black peppercorns. Steeped in about 600ml spiritus for 3 days and drained. Spiritus is a very high ABV neutral grain spirit and if you use it then it will only need to steep for 3 days and only a couple of drops are needed. If you can’t get spiritus then a vodka will do the same but leave it to infuse for a week and add 5 or 6 drops per drink. Peels of 3 limes, 2 lemons and an orange. 2 tablespoons of cloves, 5 whole star anise, 1 teaspoon of black peppercorns and a cinnamon stick broken apart. Steep in 300ml of overproof rum (wray and nephew is what we use) for 3 days. These bitters are great in a Dark and Stormy along with Angustura bitters or in a fresh pineapple and spiced rum old fashioned. Wow! Our first blog. 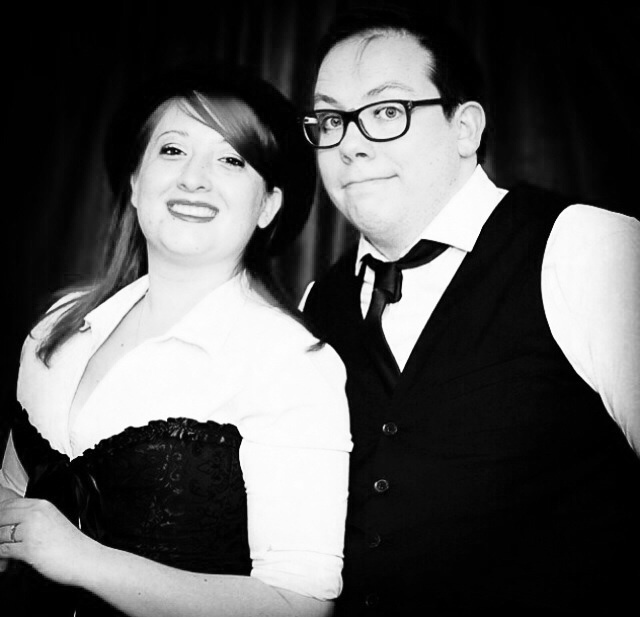 Well… We are a London based Bartending couple. He specialises in the classic cocktails with a love of Rum while I’m more of a crazy “what happens if I do this” kinda gal. We plan to post delicious cocktail recipes, cocktail ideas and just general Bartending kinda things. Short and sweet, like me. There’s also probably going to be some animal stuff every so often as I also work at London Zoo and probably some geeky stuff as Elliot’s a massive movie buff. We just wanted to give this blogosphere a whirl and if you like what you see, Brill!